It is important to be able to track your work as you go without having to have network connections all the time. We provide a warehouse processing app for Windows, Android, iPad and iPhone that allows you to do all of the processing tasks while out and about in your warehouse for each registered user at no extra cost. We know in today’s world it is important to be able to be flexible with computing hardware. So we have made our software able to run on devices you probably already have. Our software will run on any Windows 10, Android or iOS device. So you can use your iPhone, iPad, Windows Tablet, Android tablet or even your advanced scanner devices from Zebra or Honeywell. Our software works even when you do not have a network connection – updating the central database the next time you are in range. This is great for large warehouse operations or small businesses, where wiring the whole warehouse is cost prohibitive. Our software is designed to make warehouse processing tasks simple. You do not have to type in serial numbers or hunt & peck your way through a list. 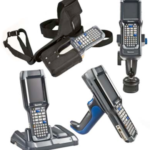 The software is designed to use your device’s built-in camera or an attached barcode scanner. This allows your team to quickly work through their pick or shipping lists to make sure they have the right item every time. Not only can our software scan barcodes and help your warehouse workers track their work, it can also print barcode labels. We have designed our label system to be flexible with lots of options for layout and what to put on the label.